Lucifer closes out its third season -and most likely the series itself- with a murder investigation, characters dealing with their grief and a game changing cliffhanger ending. The episode picks up from last week with Charlotte’s body being removed from where she was murdered and almost immediately starts with the investigation into her murder. This particular investigation is different to the standard structure this show follows because we as the audience already know for a fact who the killer is -instead of having a very strong suspicion based on whoever the most well known guest actor is- so it’s a story about the characters catching up with the knowledge the audience already has rather than following various clues to reach a given conclusion. This frames the narrative as a game of cat and mouse with both sides of the investigation working to outsmart the other and it makes for really compelling viewing. For a start it’s a refreshing storytelling choice and it also shows how devious Cain can be when he’s tested as well as how resourceful the core characters can be in a situation that is very difficult to navigate. Investigating the death of a main character brings a lot to the table as well as everyone has a visceral emotional reaction to it that both distracts them and fuels them throughout. In many ways this is Dan’s episode as his relationship with Charlotte takes centre stage to form the emotional core. Kevin Alejandro’s performance perfectly conveys a man dealing with so much pain and grief that he can barely think straight. On one hand he’s laser focused on bringing Charlotte’s killer to justice but on the other he’s so consumed by the loss he feels that he’s not as effective as he could be. This manifests in a variety of ways with one of the most effective being early on in the episode when Lucifer casually admits that he has known all along that Cain is the Sinnerman. Dan rightly calls him out on keeping this to himself and nearly lashes out at him only to be stopped by Lucifer who has to remind him to keep up appearances. Lucifer not telling Chloe or Dan or anyone else tasked with enforcing the law about Cain’s serial killer identity was undoubtedly a mistake and he definitely realises that but Lucifer also knows that they have to be united so that they can bring him down. 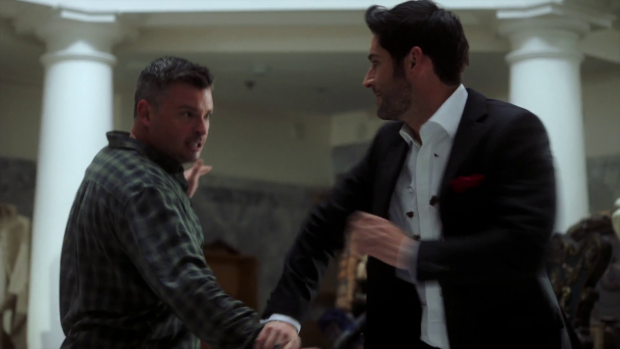 The way Lucifer turns Dan’s violent outburst into a hug so onlookers will dismiss it for grief is a really nice touch and it reinforces that everyone around them could theoretically be a spy for Cain. They are very much on their own with this one and knowing that raises the tension significantly. Dan’s grief combines perfectly with his desire for revenge and allows for a number of really engaging character beats. The strongest is when he asks for time alone with one of Cain’s goons and rattles off all of his morally questionable decisions over the past 3 seasons. Successfully rehabilitating Dan has been one of the more impressive tricks the writers have pulled. This was accomplished by slowly building Dan as a complex character capable of redeeming himself and not fixating on the things he did while also never forgetting them. Dan’s confession that he doesn’t regret anything he’s done adds the right layer of menace for an investigation and reinforces the fact that his actions are in service of what he feels is the right thing. It’s complex, interesting and a really effective way to remind the audience of why this character is so engaging. The moments that focus on his grief are really moving. Little touches like seeing the waffle iron in Charlotte’s apartment make for a powerful visual summation of their relationship and what Dan meant to her. His scene with Ella where her empathetic nature shines through in recognition of his grief is equally powerful while showing that Ella is also in pain after losing a friend. Aimee Garcia plays the scene with so much nuance as Ella offers emotional support while needing some herself. It’s a strong reminder that Charlotte was important to her as well as Lucifer and Chloe. Doing this gives her death so much added meaning and makes it a significant event for all concerned. Cain very much descends into full villainy in this episode and it’s a natural transition because it has been earned through the attention he has been given in the prior episodes. It is very clear that he is a manipulative narcissist who completely lacks compassion. His unnaturally long life means that he devalues the lives of others because he doesn’t see the value in forging meaningful relationships since their life spans are tiny compared to his. Things have changed for him recently after losing the mark but he remains largely the same. The key change for him is that he has become more desperate because he has never experienced the fear of death before. One of his lackeys observes this and his reaction is a very violent one as he points out that fear of death makes him more dangerous than ever. Tom Welling fully commits to this almost maniacal version of Cain and does a great job. The beauty of how the character is written and performed is that the nuance isn’t lost as part of Cain’s villainous role involves keeping up appearances. There’s a lot of different sides to Cain’s role in this particular episode. I mentioned above that he has to keep up appearances which he does in a variety of ways. His impassioned speech about Charlotte Richards being one of their own and solving her murder being a priority has a sinister subtext to it because we as the audience know he’s responsible and is simply playing the part that is expected of him. The most amusing thing about this is that this allows Chloe to cast aside all doubts when she immediately realises that Cain would never be so emotional so must be lying. By trying to divert suspicion he inadvertently confirms that there’s a reason to be suspicious. Later scenes with Dan and Ella also come across as being somewhat nefarious. He tries too hard to be the compassionate and understanding boss with Dan when he insists that he should go home. This scene is especially great because Dan struggles to look at him as he pretends that he doesn’t know the truth so there’s a lot of strong character work going into that one exchange. A similar thing happens with Ella with her actively trying to deceive him as he keeps up the fiction of trying to solve Charlotte’s murder. 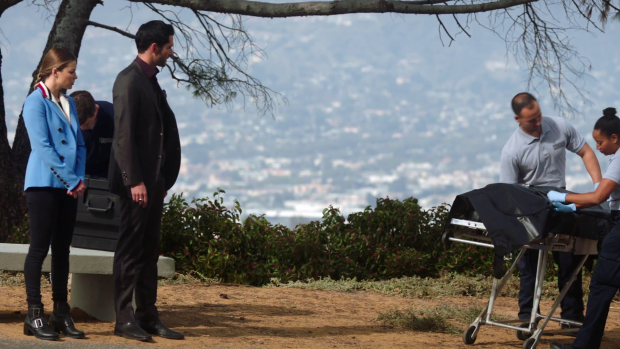 A lot of the episode is spent with Chloe, Dan and Lucifer considering their next move very carefully because Cain is in a position of power and won’t easily be removed from that. Even when removing the fact that he’s in a position of authority within the LAPD he still has a network of people loyal to him for one reason or another as shown throughout. 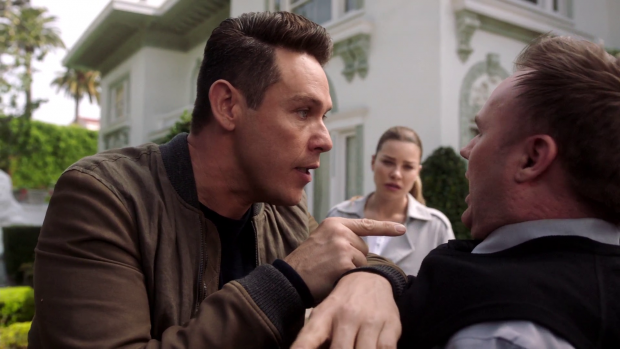 Lucifer proves how much power Cain has when he recklessly confronts Cain and finds himself at the mercy of the police officers in the station when Cain simply calls for help. It’s strong proof that he holds all the cards and there’s nothing that can really be done about it. 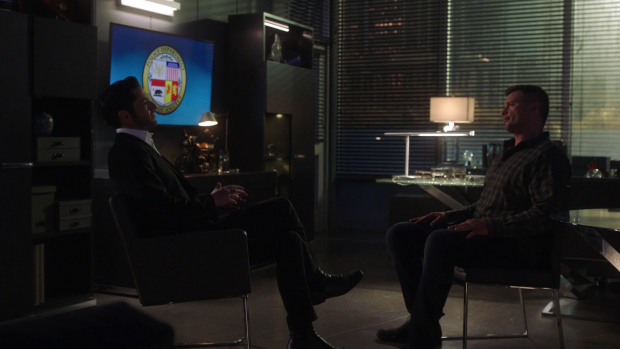 This conversation also clues Lucifer in on why he killed Charlotte and how it was an accident on his part with the intended target being Amenadiel. Lucifer isn’t exactly thrilled by this admission and grows to hate Cain even more as a result. Eventually it does come to a head in the phone conversation between Cain and Chloe. At this point she is still in the dark about his background so him being the Sinnerman doesn’t really make sense to her. She struggles to understand his behaviour and questions whether their relationship meant anything to him. From his point of view he has convinced himself that he was and still is in love with Chloe but I would personally say that Cain is delusional on this subject because everything else we know about him suggests that he’s incapable of those sorts of feelings. Given his narcissistic personality it’s more accurate to assume that it’s an obsession that he has mistaken for a real connection. 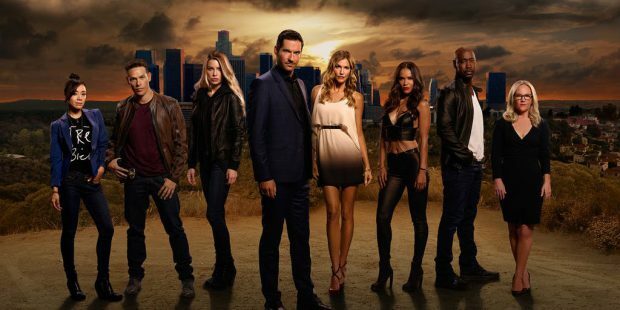 The trap that Chloe and Lucifer are lured into makes for a great twist. Cain’s goon lying about having a sister who is being used to motivate him to help Cain. It’s a reveal handled in a really matter of fact way allowing it to have more impact as the realisation slowly dawns on both the characters and the viewer. The situation is another example of how well connected Cain is and it makes for a really tense sequence. Lucifer using his wings to shield Chloe from a hail of gunfire is brilliantly handled because it sums up how much he cares for Chloe. It’s a profoundly selfless act with no regard for his own safety and clearly causes him a lot of pain thanks to Tom Ellis’ pained scream as the bullets impact his wings. 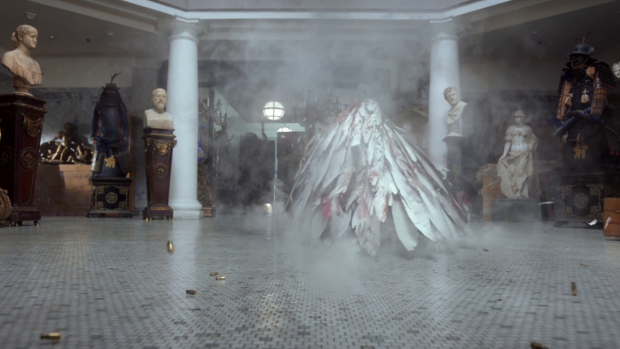 On a visual level it’s a great looking sequences with the mixture of feathers and blood making for a really striking image. After this Lucifer gets Chloe to safety then goes after Cain himself. Cain makes it a fair fight by using one of Maze’s blades capable of killing an Angel as a contrast to his own mortality. Both combatants can be killed meaning that the fight has real stakes that make it more exciting as a result. It’s a very well choreographed fight and has so much dramatic weight to it because it feels like the antagonistic relationship these two characters have always shared. Ultimately Lucifer comes out on top because he has more to fight for where Cain is completely alone which proves that the time spent building a strong support system for Lucifer has paid off in measurable ways. Cain’s death has a lot attached to it. The most obvious is that he is finally able to experience death and finds that it’s not as bad as he thought it would be. He also feels secure in the knowledge that he has avoided Hell because he regrets nothing in his life which allows Lucifer to enjoy a sense of catharsis when he is able to condemn Cain to eternal damnation by pointing out that it’s not all about regret. Cain made a mistake when he killed Charlotte and actually identifies that act as a mistake which is enough to create enough regret in his life that he will continue to punish himself for that error. Lucifer takes great pleasure in telling him this as his eyes take on that familiar Devilish glow. 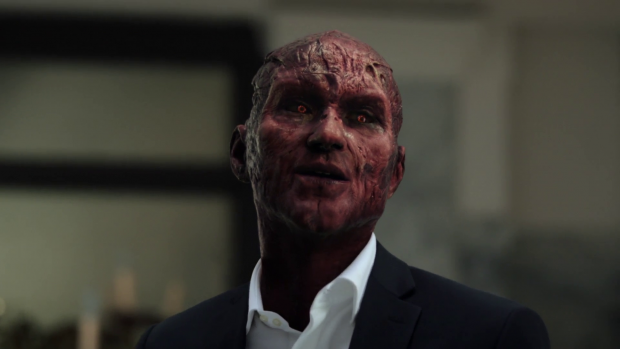 The return of Lucifer’s Devil Face definitely backs up the free will theory that Amenadiel detailed in the previous episode. Once the events are analysed from that perspective it does start to seem more plausible. Lucifer’s Devil Face could be a physical manifestation of seeing himself as a monster. He mentions that God and his fellow Angels saw him that way after his failed revolution so that was how he started to see himself. The physical side of it may have everything to do with that and nothing to do with God punishing him. Similarly his wings returning coincides with the feeling that he is becoming a better person so the negative perception of himself melts away as a result. Having it return at the moment he kills Cain makes sense because he may be inclined to see himself in a monstrous light now that he has killed a Human, the one thing Angels are supposed to never do. It’s a really interesting theory that the episode stops just short of confirming though as far as Lucifer is concerned it is now the truth. He is known for twisting evidence to come to certain conclusions and this does make a lot of sense. He even applies it to Cain because he interprets the loss of the mark coming at the one time in his life he performed a selfless act. If the free will angle is accurate then the physical manifestations become a metaphor for failure to accept the truth. Lucifer feels like he’s misunderstood and victimised when he actually did something harmful to his family but can’t admit it so gains a Devil Face. Eventually he accepts the fact that he’s a monster but his actions suggest otherwise so his wings are restored and the Devil Face disappears. Here he kills a Human, something he knows to be something an Angel should never do so the Devil Face returns Basically his subconscious is sending signs that were being interpreted incorrectly up until now and this is Lucifer starting to experience personal growth to a degree that he hasn’t before. On that subject is Lucifer’s relationship with Chloe. Unfortunately there isn’t time for it to be given much attention in this episode due to the urgency of the situation which is a missed opportunity as I could see points in the episode where it could be relevant. A good example of that was early on before they really got to work solving the case there could have been some time given to letting have a moment to consider this loss relative to what they shared at the end of the previous episode. What was supplied was definitely really good though and makes good use of their dynamic. For the most part the focus is on honesty, at least from Chloe’s perspective as she resolves to have a conversation with Lucifer about the things he’s keeping from her. Lucifer does pride himself on honesty but Chloe sees it all as an elaborate metaphor used to compensate for some significant trauma in his life. She has no evidence that Angels, Demons, God, Heaven, Hell and everything associated with it are real so the way she compartmentalises it is by humouring Lucifer and indulging the fiction he has built in his head. There have been numerous opportunities for her to learn the truth and the show hasn’t done anything with them but this episode finally delivers on that knowledge when Chloe catches glimpses of the wings and sees his Devil Face at the end of the episode leaving us on a cliffhanger that will never be resolved. In some ways that’s fitting because it leaves the show on an ambiguous note now that Chloe knows the truth. We’ve seen a long exploration of how Linda reacts to that knowledge and a different approach taken by Charlotte when she learns the truth so Chloe’s reaction wouldn’t necessarily follow the same path. A potential conflict was nicely set up when she told Lucifer that she doesn’t see him as the Devil to then end the episode literally seeing him as the Devil. The one thing that was common to both Charlotte and Linda was that processing what they had learned took some time so the same could probably be assumed for Chloe who would have to resolve her feelings for Lucifer against what she has learned and then make up her own mind about how she sees him now that she knows he is literally the Devil. It’s a fascinating prospect and perhaps leaving how that progresses unanswered is effective enough in terms of keeping the audience talking. Of course the other side of that is that it’s immensely frustrating because there is a lot of potential for this to develop. Chloe finding out the truth is a significant turning point for their relationship in one way or another and not being able to see that explored is definitely not what I would have wanted. My speculation is that the relationship would be strained for a number of episodes before Chloe accepts it and either decides that pursuing a romantic relationship is worthwhile or holds off for longer until she feels more ready for it. It’s possible that this could make for difficult viewing as it would have drawn things out even further but now we will never know. Maze started her road to redemption last week and continues with that in this episode. The first thing she has to do is escape captivity courtesy of Cain which involves her violently fighting off a dozen people and running 4 miles. She does all of this to make sure that Linda is safe following Cain’s threat on her life in the previous episode. Linda is moved by Maze’ gesture and sees it as a very clear sign of how important their friendship is to her. Having her simply ask “Are you okay?” when she’s clearly in a great deal of pain is a really simple yet moving moment that sums up how deeply Maze cares as well as how much she wants to repair that. She even apologises for her behaviour and makes a point of saying the words because for her actions are a lot easier so speaking the words means a lot to her personally and she wants to make sure Linda understands that. It’s a very satisfying progression for Maze and Linda and it’s good that the last we see of them together is the mending of their friendship. An excellent episode that delivers a moving, character driven murder investigation as well as a game changing cliffhanger that capitalises on the strong Lucifer/Chloe dynamic. Having the murder investigation focused on a victim the viewers know well and the main characters were all close to adds so much weight to the situation as well as giving Charlotte’s death meaning by devoting an entire episode to dealing with it. Much of the focus is on Dan who struggles to hold himself together after this loss but wants to bring Charlotte’s killer to justice. Having the murderer be known to the viewer as well as the characters is a great way to enhance the tension as it changes the plot to a game of cat and mouse with each side working to outsmart the other. Cain descending into full villain mode for the purposes of this episode works really well because he retains the nuance that has been developed across the season and proves himself to be formidable because he is well connected. The approach taken by Lucifer, Chloe and Dan to prove his guilt is interesting to watch play out as they carefully consider every move before making it. 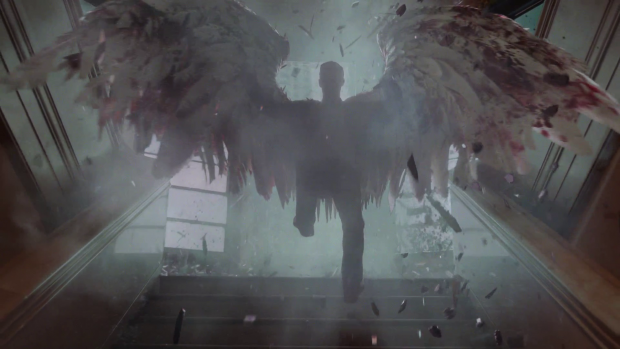 The sequence involving Lucifer shielding Chloe with his wings as he suffers unimaginable pain from a hail of gunfire is visually impressive and very well done as is Lucifer’s fight with Cain where the playing field is levelled since both of them can be killed in that moment. Exploring the free will theory relative to Cain’s death and tying it to various emotional milestones experienced by Lucifer over the years is really fascinating along with the sense of catharsis experienced by Lucifer as he condemns Cain to eternity in Hell after he finally dies. This also comes with Chloe finally learning the truth about Lucifer and leaving the viewer on a cliffhanger that will unfortunately never be resolved. The continuation of Maze’ journey towards redemption is brilliantly handled with her singular desire to make sure that Linda is alright coming across as really moving. Having her desperate to apologise to Linda verbally because she recognises that using words doesn’t come all that easily to her is fitting for her character and makes for a great moment for these characters to share. It’s fitting to have the last we see of these characters be the mending of their friendship. Normally I would devote this section to speculation on what will come next but since it’s unlikely that we’ll see any more of this show I felt it necessary to share some thoughts on this show in general and the impact it’s had on me as both a viewer and a reviewer. When Lucifer started I found it entertaining enough if a little ridiculous and shallow. A strong pilot was followed by mediocrity in the early episodes before it really picked up towards the end of the season. The core elements were always strong enough such as Tom Ellis’ magnetic self aware portrayal of Lucifer and the dynamic he had with Lauren German’s Chloe. Other characters took a bit longer to come into their own such as Maze, Linda and Amenadiel but eventually became indispensable members of the cast. Even Chloe was lacking in personality to begin with so this was a show that took some time to find its feet. Once it did it was routinely excellent with bad episodes being a very rate exception. The writers very quickly settled into a groove of what the show was better at and found ways to better utilise the characters to maximise entertainment value while delivering heavy duty characterisation. I’ve reviewed this show since the beginning and it has been my pleasure to do so. Even with the rocky start I’ve always gotten a lot out of this and looked forward to watching it every week so the fact that it has now been cancelled is something I find really upsetting. I don’t blame the writers for leaving the season on a cliffhanger but the network should take a proper look at the quality of their output and reconsider their decision because there are still so many things that could be done with this concept. It has continued to evolve over three seasons and there’s no reason it couldn’t continue to do so over the course of another three. From what I’ve seen Lucifer has a loyal and devoted fanbase who what the show to come back so I would urge any readers of these reviews to take to the internet and make their feelings on this show known. Thanks to everyone who has read what I’ve written about this show over the past three years, it has been my genuine delight to share my thoughts on it and I’d love to extend my gratitude to all those who brought us Lucifer for providing me something I always enjoyed writing about.